Hi GasLightStreet, been thinking about you - hope all is well with you and your wife. My wife died September 16th. Thank you, though, for your kind words. So sad to hear these shocking news, Skippy. I wish you all the best and power to get through these difficult times. Ian, I am indeed a guy (not a gal). Bleak might have been too strong a word, so lets just say things really aren't looking that bright. And not to sound too doomy and gloomy as I am being cautiously optimistic (an understatement), but somewhere in your timeline above there have been quotes from band members (maybe it was only Ronnie) where they were going to start afresh on all of the material. And then there was Mick's diversion from the band with Getta Grip which seemed like the entire process of the "new" album was going one step forward, and then two steps back. Keith refusing to play on it couldn't have helped the vibe in the studio! Then there was a tour that diverted all of their attention away from the new album, and unfortunately there was no talk at about it amongst the band (see mpj200's post). Seems in between shows or during soundcheck might have been an opportune time to maybe discuss it - even one new song, but as far as we know all was quiet on the battle front. Meanwhile, the tour is over, and Mick was "dating" a 22 year old - do you think he cares about being locked in a studio with Keith any time soon? Then there's Ronnie happily back home with his wife and twins, and Charlie needing a well deserved rest and probably more worried about his horses than a new album. A for Keith, who knows...maybe hibernating like Rip Van Winkle waiting for the UK tour to begin. Either that, or smoking gigantic spliffs and re-organizing his massive record collection. Hopefully they do have some time to get something done with the new material (if any of it still exists), but with the UK tour on the horizon, they can only give so much of themselves to the band itself. There's more to life beyond the Rolling Stones and fans expectations for them, and at this point in their 50+ year career, can you blame them for taking their sweet time? Album is still definitely on plans ..
"The plan as of now is that the Stones would go back into the studio in December to work on the new album. The aim would be to finish it up by spring, in time for the tour which would start in May. Of course, plans can always change." Album was never in jeopardy of not coming through .. or in trouble of being tossed.... just taking their sweeeeeeeeeeeet friggin time with this one is all. While there's no reason to doubt good old heins57, we should also remember what trustworthy mpj200 previously said. In other words, don't get your hopes up too high and start celebrating just yet. Even heinz57 himself said "plans can always change", so nothing's etched in stone. Maybe after 13 long years a new album of originals will eventually come out, whether it's in May 2018, or May, 2023 - nobody truly knows, but time will tell. Edited 1 time(s). Last edit at 2017-11-15 08:32 by Hairball. I don't mean to disrespect or make fun of anyone... and I am certainly not saying others are lying or anything like that. I will say this... (as I always have) ... when 'heinz57' makes the rare appearance here ... in which he or she does ...rarely... it is truth. We've found that out in the past. I have been waiting for heinz57 to say something..
Id say this person is miles beyond anyone here in terms of being in the know... because of what they have told us in the past.. well before even a rumor was started. I actually think it is someone very...very close to the band. I don't even see this person as an insider.. I see it as someone who is quite close to the group ..possibly family. So I consider Heinz57 and to a degree Georgelicks the two people onthisboard who know something. I think Georgelicks is only as privy as some people up at Universal are. I actually think heinz may damn well be a close relative (daughter or something) ..to a band member. Edited 2 time(s). Last edit at 2017-11-15 10:48 by IanBillen. I think you're imagination has run wild! And what do you have against mpj200? He's always been right on the money as well, but perhaps you're picking and choosing favorites that lean towards your hopes and wishes? Heinz was the first to say it was blues album (B&L). Also Heinz was the one to say it was 'covers' and not new material. Later he or she came on and told us that it would come out in December. He also was the first one to make note of the recording sessions in 2017 in May with The Stones.... a Full month before they occurred. He (or she) has been well first and spot on with everything over the last year and a half As well he or she only gives us a sentence and then disappears. It would appear Im picking favs that lean to my side but Heinz has not only been scant.. but as well spot on and well first...on everything recording and release wise. Those are my reasons. Certainly nothing against and not knocking mpj200 ..
Edited 2 time(s). Last edit at 2017-11-15 11:07 by IanBillen. Sounds convincing Ian, but again don't count any chickens before they're hatched. Trying to be semi-positive here, but there's LOTS of variables at play - for all we know we could end up with another Getta Grip from Mick!!! 13 years without an album of originals can sap the optimism out of even the most diehard fan - but as long as this thread continues there will always be hope. Edited 1 time(s). Last edit at 2017-11-15 11:18 by Hairball. They could always release what they have as extra tracks on "60 and Counting" which is not too far away really. Heinz is just a good connected fan.Don't expect too much. It took him 3 years to record his latest solo album, so 2 years since the first Stones session (Dec 2015) is about right. Then a new album around December 2018 and concerts in MSG same time. Sounds good. I'd settle for another Blue and Lonesome (pt 2), and even though it was only covers and was sort of a novelty, it was the "best Stones album" in decades - plus it sold well for them. Meanwhile, I would love to hear some more Keith solo material - both old and new. The long talked about superior version of his One More Shot (according to Steve Jordan) would be a nice start. And a deluxe version of Crosseyed Heart has always been on my wishlist - demos, outtakes, extended versions, etc., etc., etc. Maybe a super duper deluxe box set of all his solo material similar to the Beatles Anthology...including almost ALL of his work outside the Stones (guest appearances live and studio with other artists, etc.). There's a gigantic mountain of material that most Stones fans would die for! I hope you are more optimistic now .. there were well over two hundred comments on that Instagram post. Keith (or actually who works for him / them) responded to only one that I am aware of. It was the one about the next / another Stones record. He responded they / he is working on it... with an exclamation point no less (seems more a general response but still its there). He / they responded for a reason .. it is still very much a 'go'. Now.. Im not a fortune teller so I cannot predict the future.. Hell anything can happen in life .. who knows whats to come in any of our futures .. But I can say this with confidence.. seems the new record is still a plan, still officially a go, and still slated for release (in 2018). Has not been scrapped or pushed aside and they certainly have not given up on its release. Edited 2 time(s). Last edit at 2017-11-15 22:41 by IanBillen. That about sums it up Ian - none of us know. And for Keith (or whoever wrote that for him) saying "working on it" is as generic and general as it comes. It's akin to me saying "I'm working on my next series of paintings". That could mean a number of things - daydreaming, drawing sketches, stretching canvas, or the possibility that I'm actually in the process of creating one right now - but there's still a whole series of between 8-10 that need to be completed! It will happen some day, but there's no definite timeline - just like the supposed new album. One thing is certain though, I will have completed a new series of paintings before the Stones release a new album of originals which could be anywhere from May of next year to May of 2023. One thing that is discouraging about the new record--if they are indeed working on it, they are not doing it very enthusiastically, making me wonder about how confident they are in the quality of the material. It makes it look like their hearts aren't into it, and if there were some killer tracks, you'd think they would be more eager to get it finished. Of course then you have the example of Keith's Crosseyed Heart, which took forever to make and is fantastic. So who knows... I was hoping for some product by Christmas season but I guess not to be. I think Micks Getta Grip might have thrown a wrench into the entire process. Hopefully they've been able to set all differences aside and start afresh after the recent tour. Keith was quoted as saying he wants something traditional and 'Stonesy' (even a B&L pt.2) while Mick was more forward thinking wanting to explore new territory. Both might have to compromise their demands and wishes, and hopefully things will mesh from there. If they had anything that could be considered finished or even close to being finished, it would have been nice of them to play something live during the recent tour. Instead, the newest original tune they played was from the '90's...kind of sad. They might be just as enthusiastic even though they are working in spurts? They will always say there is a new record planned, always. They have some unfinished tracks they worked on. It's always the case. Whether or not they will actually record and release a new album? In my opinion in is all speculation and I think that Mick and Keith do not honestly know at this point. Hairball's post above is correct. They are always working on a new album. By definition. But nobody knows if and when an album will be released, not even the Stones. Right... but why respond to that particular comment at all. Keith (well who wrote that for him) almost never responds. There were two hundred other comments there. It was purposefully dropped ..purposefully slid in to give us a heads up (reading between the lines is easy here). 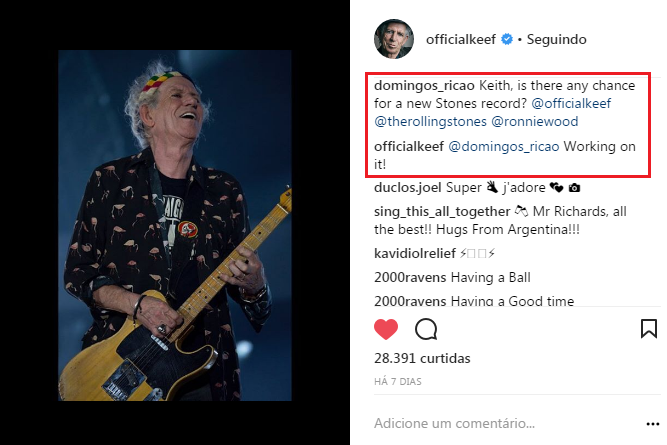 Here is what we know.. insiders we know are saying the record is still on plans and that December they are scheduled to work on it again in the studio and it is to come next year ...and the Stones themselves have commenting about a new record in the works... and just very recently. That is what we know. I know it has been 13 years but its not like this has been said every other year. They 'officially' started on new material in 2015 (which gave us the chance / spontaneous Blue & Lonesome). Sessions are most likely scheduled for next month .. and they maintain it is in the works still. Universal says it is slated for next year. There is good reason to think the album will come .. I'd say its more than just an idea .. Id say its a working plan in action .. though a very...very slow one. There is much more reason now to lean toward one coming than not. This was the comment I was waiting for. We will hear more next month Im sure. As for me I think things look good... Im optimistic about it coming next year at this point .. cautiously optimistic.... not saying its set in stone... but the plans are set in stone to release it next year Id say and studio sessions are planned to complete it. I'm good with that (for now anyway). Edited 1 time(s). Last edit at 2017-11-16 01:08 by IanBillen. We also know as history has proven that these things are easier said than done Ian - otherwise a new album of originals would have been out before Blue and Lonesome. That album was a nice consolation prize so to speak, but what most fans have been hankering for is a brand new album of originals - 13 years in the making (and counting). If all they could muster up as a band during that looong period is One More Shot/Doom & Gloom, and an album of covers, then there's reason for to be cautious and skeptical. Is the glass half full, or half empty? I'm not so sure there's even a glass to begin with - I need to getta grip! Hoping for some Keith solo material...there's more of a chance of that happening as he only has to answer to himself. There is good reason to think the album will come .. I'd say its more than just an idea .. Id say its a working plan in action .. though a very...very slow one. They don't really need to put anything out, so I suspect there is a temptation to hold off on releasing what is virtually certain to be The Last Rolling Stones Album Ever, something that would unavoidably feel like the final nail in the coffin. They may also feel the need to take their time and make sure it holds up compared to their past work. Im not pointing fingers at anyone ...but I must say props to you Dandelion. Their record company, The Rolling Stones, Rolling Stone magazine and some insiders here say an album is to come. Noooooooooooooobody official ever said it was scrapped. So either the insiders, The Stones, and folks at Universal are all blowing total smoke up our arses or maybe it simply ....'is what it is' ..
>>A sloooooow work in progress... done in spurts.. but planned to finish over this year and released the next. Stones fans always look the other way and turn a blind eye to what is. They Stones gathered three or four times officially ...with people breaking their schedules to record in an elaborate world class studio. These things are either an official go with a plan or not. It isnt like these guys all get together in a basement and jam now and again. See here>>> Professional musicians and world class engineers and a record producer are / have been setting time out in their schedules flying across continents for this thing a few times... Its not for nothing and its not done on a whim. These things are big league ... and it costs money, time ...booking etc.... It was done for a reason...and if they are scheduled to get together in a studio in a month >>> there is solid reason behind it. Again ..this isn't a bar band gathering in someones basement studio when they get the urge ..this is the real deal with big money, schedules, time etc. on the line from people who cannot have their time wasted (hope that puts things into perspective). These guys are not flying to London and having a world class studio booked ...with world class musicians meeting them ....just to kick the idea around. Its for a solid purpose .. and with a solid plan ...trust me. Edited 1 time(s). Last edit at 2017-11-16 04:25 by IanBillen. Not long ago Ronnie said that they may start from scratch. Mick's Getta Grip was released with Charlie and Ronnie playing on it, but without any input from Keith. They occasionally put out "news" so people think they're still a functioning band and to keep hope alive - yet it's been so long that they've put out a new album of originals - 13 years - that it's hard to take any of the PR seriously any more. While they may have some scraps of material that have been recorded in various spurts, that's only one small step in the process. At the rate they're going - even if they do reconvene in December - we'll be lucky to get a new single out of them by May, 2018.